Still listening to a recitation of the sponsors of today’s event. Still need to look at the sessions sheet and make a decision. BTW, bandwidth and power outlets are in good supply here. 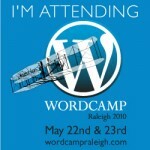 BTW, #wcraleigh is the official twitter hashtag for the blessed event. I debated going to the “Thoughtful Theming” session, but as I may be working with Drupal soon – figured I’d better get into Taxonomies for WordPress to understand the differences. What can I make new post types? Basically, then you can ‘cook-in’ a custom page type that meets your organization’s needs. Instead of Zombies … think about adding a new taxonomy “Teachings” for your church website as a taxonomy … and then add as a post types Bible Study, Sermons, and/or Sunday School Lessons. Why not just use posts? Well if you only want to show your ‘teachings’ you can drop the code before the loop to only show ‘teachings’ as opposed to other stuff. … especially when youÂ use WordPress 3.0 to host several websites, and want to insure ‘Teachings’ is available to all users … and when you want to create aggregations/displays in themes of said taxonomies and page types. Oh, if you want to enforce Taxonomies across a multi-user network, don’t go with Functions.php … but use a custom plug-in to enforce a taxonomy across all users within your WordPress MU network. Currently, there is no tool out there to convert categories into taxonomies. It’s 11:00 … waiting on local Social Media star Wayne Sutton whom appears to be fashionably late for his presentation. Apparently Wayne thought things would start at 11:15 … bah! Should have I gone to Amazing API’s? … interesting mix of individuals with various skill levels and adoption of services like Twitter, FaceBook, and WordPress. Building your network, talking to your friends, ever expanding network … but still need to let the world know you’re alive. WordPress as a lead generation tool. Social Networks can be implemented w/out a bit startup cost by using BuddyPress. Don’t think of WordPress as a Content Mangement System … but a Content Publishing System w/SEO out of the box. Also keep in mind that search engines are elevating blog content over other content format types. Outline your topics and blog, blog, blog. Less tweeting, blog more … provide meat over milk. Instead, use tweeting to drive folks into your blog posts. Your blog and tweets are only going to reflect how you succeed and add value in the real world. Describes the Tri-Out blogging story as a model for establishing a brand. And don’t buy the bunk that there are ‘official rules’ for how to employ Social Media services such as FaceBook and/or Twitter. Oh, and use Analytics … and get ready for a flurry of activity for geo-based, location based social media services for more targeted and qualified leads.